Are you looking for unique ways to activate students' problem-solving skills and engage their logical reasoning skills? 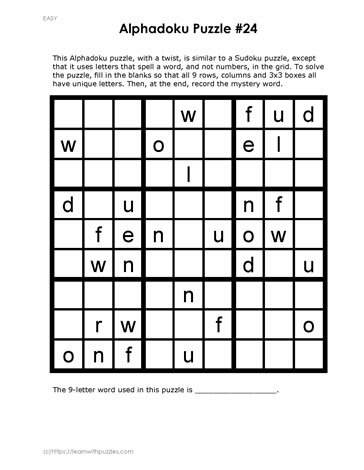 Download, print and have students solve this unique nine-letter word puzzle. Discover the nine letters and remember to use basic Sudoku rules. 1. Make sure that each letter occurs only once in each column. 2. Make sure that each letter occurs only once in each row. 3. Make sure that each letter occurs only once in the 3x3 grid. If students have not figured out what the unique nine letter word is, then challenge them to discover it and record the information at the bottom of the page.